Crew members of Columbia STS-107 participate in training for in-flight maintenance. 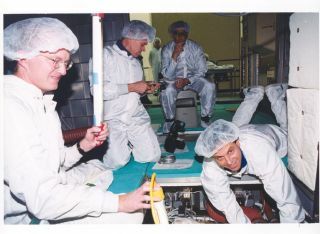 In this historical photo from the U.S. space agency, members of the STS-107 crew take part in the In-Flight Maintenance training in December, 2000 for their mission. One of the payload elements on the mission was the SPACEHAB Double Module in its first research flight into space. Working with equipment inside the SPACEHAB Double Module are (left to right) SPACEHAB trainer David Butler, Pilot William C. "Willie" McCool, Commander Rick D. Husband, and Israeli Payload Specialist Ilan Ramon. For more information on STS-107, please see GRIN Columbia General Explanation.